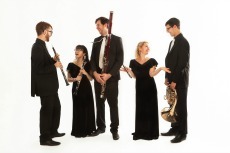 The Schubert Ensemble is one of the UK's most experienced and dedicated Chamber groups, and their seminars and concerts provide some of the highlights of the Chamber Music experience at the Conservatoire. 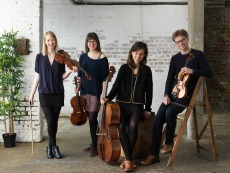 One of the UK’s most exciting quartets, with a burgeoning career, the Heaths join the Conservatoire as Quartet in Residence in September 2016. They will offer seminars, coaching and masterclasses. The Atea Wind Quintet is the Associate Ensemble in Residence, and has been immensely popular with the students in the Woodwind Department, offering performances, coaching, fascinating seminars on a variety of topics such as breathing, and valuable information on the route to becoming young professional wind players. 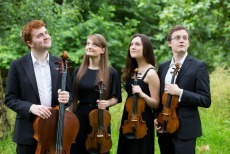 The Fitzroy Quartet was formed at the Royal Academy of Music in 2014 by 4 award winning musicians from the UK, Italy and Slovenia and are extremely looking forward to returning to the academy as Chamber Music Fellows in 2016/17. They have enjoyed a busy 2015/16 season giving their Wigmore Hall and St Martin-in-the-Fields debuts, and performing in Halesworth Arts Festival, Regents Hall, Colstan Hall, Masonic Hall, Lodz Academy of Music (Poland). The quartet are looking forward to their 16/17 season giving more concerts across Europe and the UK. 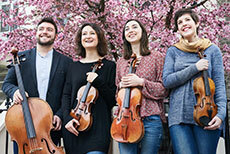 The Behn Quartet is formed of players from England, the Netherlands, Portugal, and New Zealand. 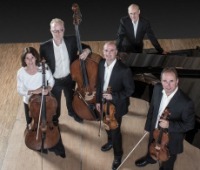 Winners of the Orlando International Chamber Music Competition, they are currently an Associate Ensemble at the Royal Birmingham Conservatoire, and previously held the CAVATINA Chamber Music Fellowship at the Royal Academy of Music in London. They take their name from Aphra Behn, the seventeenth-century playwright, political activist, and philanthropist of the arts. 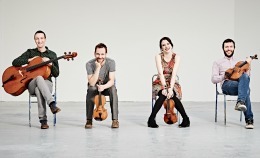 Originally formed in 2006 while students of the Royal Academy of Music in London, the Jubilee Quartet now exists as a collection of four musicians from across the globe. 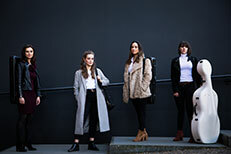 Although the group is based in London, each member brings his or her unique sense of cultural identity, and the group thrives on musical inspiration from the Czech Republic, Canada, Spain, and England. 2018 has been a thrilling and productive year, with the recording of three Haydn quartets completed for Rubicon Classics, performances and workshops with ProQuartet and ChamberStudio in London, Paris, and Roussillon, as well as the appointment of Associate String Quartet in residence at the Royal Birmingham Conservatoire.